It isn't really all that surprising that when Nintendo finally decided to embrace virtual reality for its big-selling Switch console, it decided to have a bit (a lot) of fun with it. Ninty's first foray into the virtual realms isn't a PlayStation VR rival by any stretch of the imagination. But imagination is the key word here. It's launching a VR version of its Labo DIY kits, which lets you build Toy-Cons (that's toy controllers) out of cardboard, reflective stickers, rubber bands and, now, VR lenses. These Toy-Cons work with a series of mini games but will also be compatible with big Switch titles too. Nintendo has already revealed that Super Mario Odyssey and Zelda: Breath of Wild will work with Labo VR, which will roll out as free updates to the big Switch games on 25 April. Unfortunately, I didn't get to try them out, but I did get to play around with the full compliment of controllers that will be available when the full Labo VR kit lands on 12 April. So how does it all work? The full Labo VR kit (which costs £69.99) includes all of the physical components to build the controllers along with the software that plays nice with the six Toy-Con projects. You’ll need a Switch console for everything to work, with the Joy-Con controllers uniquely placed inside of the cardboard controllers to create unique ways of interacting in VR spaces. To keep you going back to the cardboard controllers, Nintendo also includes its VR Plaza and Garage where you can get creative and make your own VR games. It's a bit of a complex beast to take in on first viewing, and definitely one for more experienced Switch owners to delve into. 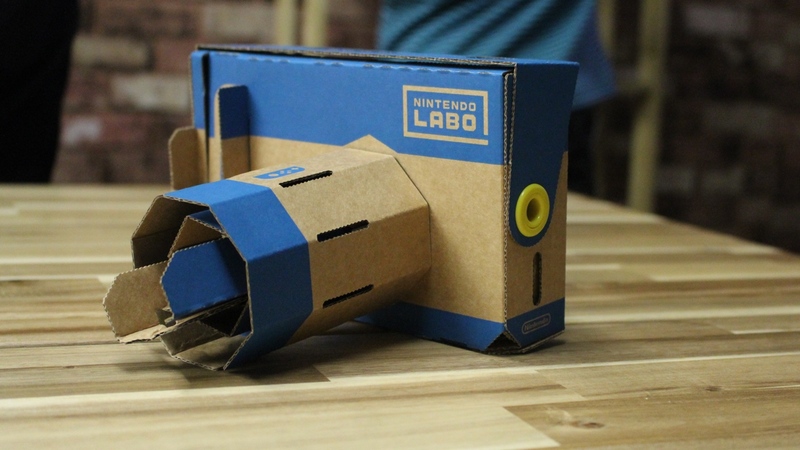 If paying £70 feels like a lot of money to spend, Nintendo is also offering a cheaper entry into Labo VR with a kit that includes two of the Toy-Cons priced at £16.99, but that doesn't include the software. While VR can often feel a very isolated experience, Nintendo is about making this for all ages, letting you pass around the completed Labo controllers around to share the action. Unlike high-end VR headsets like the Oculus Rift or the Vive, Nintendo's VR experiences are designed for younger users as well. The target age group is seven and above, and Nintendo suggests children using the VR mode should be supervised. It's done a few things to reduce the urge for smaller users to spend too much exposing their eyes to VR. Players will be advised to take breaks through in-game notices. Most of the controllers require be held up to your eyes and are not strapped to your head is another way for Nintendo to encourage small, sessions of VR gameplay. If you want to take things further, you can restrict VR mode altogether within the Switch settings. Fortunately, I had a couple of young testers to try out the Labo VR kits and there was no complaints or feelings of motion sickness using them. Of all of the six Toy-Cons available the VR goggles offer the most familiar experience. If you've used Google Cardboard before, this is essentially what you're getting, with the Switch taking place of your smartphone. Along with the cardboard exterior, you're also making use of the VR lenses and you'll need to hold the goggles up to your face. You're also relying on the Switch's 720p HD resolution to provide the visuals, so you're not getting best-in-class image quality compared to dedicated smartphone-powered VR headsets. I found I had to adjust my eyes a bit, like I do with the 3D on Nintendo's 3DS console, but after that it was a comfortable experience. With the Labo VR camera you start to get a sense of Nintendo getting creative with the use of the Joy-Cons to make each controller feel like they're offering something different. I was able to try it in an underwater experience where you need to search out sea life using one of the Joy-Cons to take the picture, while the other is placed inside of the cardboard lens. Twist the lens and you can focus in on objects to get a better shot. The Blaster controller is without doubt one of the most fun controllers of the bunch, but also showcases how Nintendo is using the different form factors to offer something new in the VR space. It places a trigger below the viewer and then places one controller on the side and one underneath the blaster's barrel, which uses rubber bands to create a pumping action. The first game I got to play with it involved shooting down aliens, where reloading had the same satisfying action of pulling back a catapult. The Joy-Con controller positioned on the side can be pulled down to slow down time giving you more time to fire off at your alien foes. The second game that's built for the blaster is a two-player game, which introduces the shared nature of Nintendo's Labo VR kit. Each player takes it in turns to draw in a piece of fruit and then attempt to fire it into the mouthes of a pool of hippos. It's ridiculous, but in true Nintendo fashion it's a lot of fun. The bird Toy-Con along with the elephant (below) are the most impressive looking controllers and again shows how positioning the physical Switch controllers can be done to good effect in creating playful uses for the creations. One of the mini games built for the bird requires pressing down on the sides of the cardboard controller to flap its wings and soar above an island, using your eyes to navigate. It's ridiculous, silly, but again, a lot of fun. The bird can also be used alongside the wind pedal that sits on the floor and you press down to add gusts of wind when you're jumping or flying. It's a really simple way of trying to add that extra element of immersion. The award for most bonkers-looking Toy-Con comfortably goes to the elephant. It places the Joy-Con controllers inside of the trunk, so you'll need to wave the trunk around to move in VR. The painting demo was a lot easier to get to grips with. Using the trunk as a brush you can simply paint away and dip your trunk on the floor to change colours. Think Tilt Brush on the Vive and Rift but a lot simpler. Nintendo was able to show us another air-related controller that actually isn't included in the Labo Kit (yet). It sits on the front of the VR goggles and requires the user blows at the wheel, which can in turn activate action in the supported game. So in the mini-game we tried, blowing on the wheel fired ammo at a range of targets in a small arena. This could add another interesting dimension to Nintendo's VR vision. It's been a while since I've come away from a VR experience and really smiled, and that's what I felt after trying Labo VR. While I didn't get to build any of the projects, it channels everything that makes people love all things Nintendo. It's unconventional, creative and it's for everyone. It's easy to think these are simply just cardboard shells for the type of VR experiences we've seen before from Cardboard, and bettered by higher specced headsets like the Oculus Go and Gear VR. But to compare this to those headsets feels unfair because they feel like a very different proposition and offer a more shared experience. The key question is whether Nintendo will do enough to keep you going back to using them, taking them out when friends are around and not leaving them to collect dust. Adding support for those big games like Super Mario Odyssey and Zelda: Breath of Wild will be key here. But there can be no debate that Nintendo wanted to do something a bit different with VR - and it's clearly achieved that.